Popular for playing Thanos in Marvel’s Avengers film series, Hollywood star Josh Brolin treated his Indian fans with a throwback photograph of him playing Holi in the country. “Happy Holi Day! India 2013,” Brolin captioned the image. 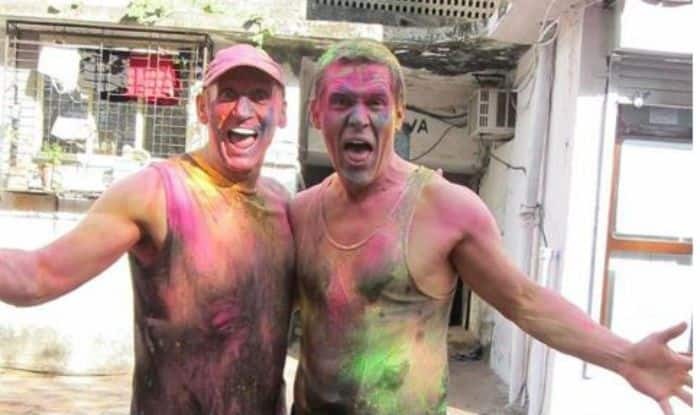 In the photograph, Brolin can be seen drenched in Holi colours with “Shantharam” fame writer Gregory David Roberts. Brolin — the super villain of Marvel Cinematic Universe (MCU) — will be next seen in Avengers: Endgame, which will release in India on April 26 in English, Hindi, Tamil and Telugu. Avengers: Endgame will feature a stellar star cast which includes, Robert Downey Jr., Chris Hemsworth, Mark Ruffalo, Chris Evans, Scarlett Johansson, Benedict Cumberbatch, Don Cheadle, Tom Holland, Chadwick Boseman, Paul Bettany, Elizabeth Olsen, Anthony Mackie, Sebastian Stan, Danai Gurira, Letitia Wright, Dave Bautista, Zoe Saldana and Chris Pratt.